Imperial City Prison is a group dungeon for VR 15-16 players. This dungeon is located in the Imperial City of Cyrodiil and can be accessed from the Imperial City. It will take approximately 60-90 minutes to complete this dungeon. You will have to defeat 5 bosses there. The dungeon is rather interesting. Bosses are strong and have different mechanics. Defeating some of them will become a challenge for your party. Overfiend is the first Boss of the Imperial City Prison. He is a melee fighter but can attack your group with several AoE abilities. In general he is not so strong and many players think that it is an easy fight. But that’s until he summons several mages from the nearby portal. Make sure you kill these mages fast because several Bloodfiends will come to help the boss soon. After they arrive, a Harvester will come through the portal and will start attacking your group. It’s great if you kill this Harvester fast because he deals high damage and can kill one of the members of your group if his health is low. 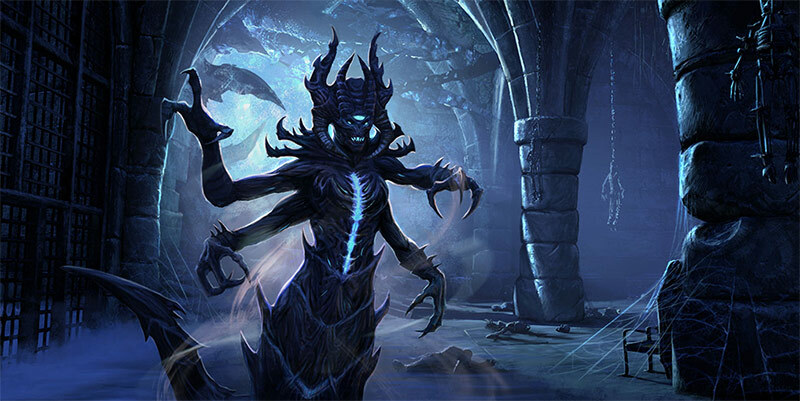 Moreover, several Dremora Invokers and Dremora Ferylkins will also come to fight against your group. As you see you will face with multiple waves of enemies that appear one by one and if you don’t kill them fast you will be in trouble. That’s why you should use different AoE abilities and synergies. Though Overfiend is the first boss, he is rather tough because of extra enemies you will have to fight against. So be careful and act fast. After Overfiend is killed you will go to the next Boss. Ibomez the Flesh Sculptor is a melee boss with two-handed axe in hands. He has unpleasant cone attack that deals damage to all players in front of him. He also summons several helpers: Flesh Atronachs and other guys. In general he is not as tough as Overfiend because there are not so many extra enemies. You will not have troubles with this boss. Gravelight Sentry boss looks like a big Vigilant Watcher and acts in similar way. You will find 4 Xivkyn Necromancers near this boss. It is recommended to take down these necromancers first. Every necromancer has 130,000 HP and it will take time. After the necromancers are killed, no extra enemies will arrive and it will be much easier to kill Gravelight Sentry. Flesh Abomination looks like big Flesh Atronach. He is a melee boss and he has dangerous AoE skills. Try to avoid red circles on the ground and everything will be fine. Red circles alert about AoE attacks and you have time to escape threat. Flesh Atronach’s magical attacks are strong and if you are attacked by several AoE abilities simultaneously you will most likely die. The Boss also summons several bugs but they are not very dangerous. This is a multiple-boss fight :) Though all of these bosses have relatively low amount of HP, they act together and they are all different. It is recommended to take down them one by one. It’s very important to act together. If you don’t kill them one by one, they may kill the group. We advise to kill the Necromancer first. He is a very unpleasant guy because he can summon different monsters and can heal his allies. Then you need to kill the Templar. And then other two enemies. The location where you will have to fight against these bosses is not comfortable. There are special areas where spikes can strike you from the ground. That’s why positioning is rather important in this encounter. Avoid red circles, red cone areas and spikes. Fortunately, there will not be other enemies. You will have to fight against these 4 guys and several summoned monsters. If your group acts well, you will not have troubles in this encounter. Lord Warden Dusk is a big boss with Molag Bal’s appearance. He can attack your party with both melee and ranged attacks. He also teleports from one part of the location to another. This boss is the las one and is the toughest. You will face with large amount of incoming damage and with many AoE attacks. Lord Warden Dusk appears in the center of the location and the fight starts. He has an interesting AoE attack: he casts large damage area that looks like blue circle but the area is not static. It slowly moves on the ground from one place to another. Then he summons another area and you will have to avoid them. Such area deals high damage and if you are attacked by both your HP may become low. We advise always pay attention to these areas and avoid standing inside. These areas will be moving on the ground until the end of the encounter. At the middle of the fight Lord Warden Dusk will transform into 5 projections. Each shade has 190,000 HP and you will have to kill them all. The shades attack players from range and summon AoE meteors. The only advice here is to take down the shades one by one. Kill the first, then kill the second and so on. If you don’t act together the shades may destroy your party. The good news is that shades don’t move and always attack from one place. During your fight with shades blue damage areas are still active and are moving. So don’t forget to avoid them. After you kill the shades Lord Warden Dusk will appear again and you will have to fight with him directly. Then he will split again and you will have to deal with the shades once more. After they are defeated the boss will appear and you will be able to kill him. Lord Warden Dusk is the final boss and after he is destroyed the dungeon is completed.